Kapow is a circular, multiplayer obstacle course with two unique sets of rotating boom arms. One arm is designed to hit players about thigh level, spinning counterclockwise, while the other rotating arm spins in the opposite direction aiming for the players’ chest, both designed to knock over the players. 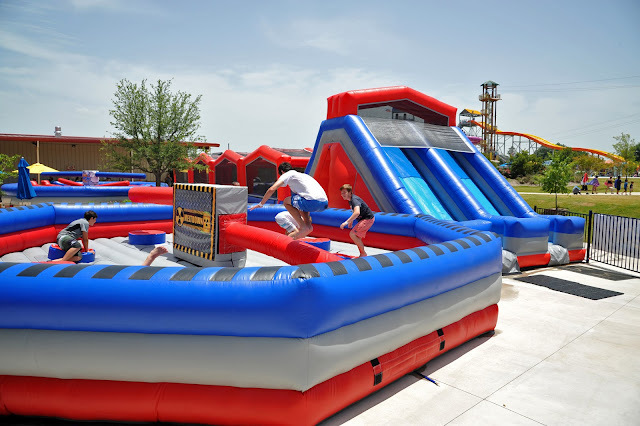 At the start of the race, both contenders begin in their own lanes, each dodging the rotating boom arms and other challenging inflatable obstacles. Since the course is designed in a circular maze, each contender doubles back on themselves three times. Kapow tests a players agility as well as stamina as they attempt to beat their opponent. Meltdown can accommodate up to eight players per game in a challenge of agility, stamina and reaction time. With two rotating boom arms, each contender must make split-second decisions to either duck beneath the arm or attempt to jump over it. The suspense increases with each rotation of the arms and with rapid changes in speed and direction. Who will be the last one standing? 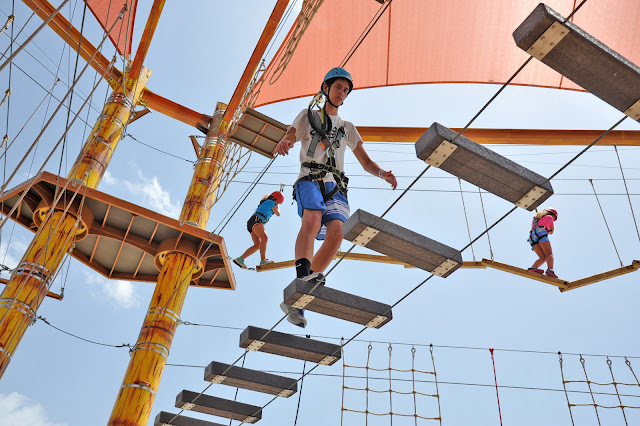 Toxic Rampage is a 2-person race through seven sets of challenges that each contender must overcome in order to be the winner, culminating by climbing Meltdown Mountain and sliding down the other side. The cost for the Waikiki Wipeout Zone is $5 for two attractions or $10 for unlimited play. Fortunately, I had the foresight to choose unlimited play because the boys wanted to go again and again. Finally, after they played on the Waikiki Wipeout Zone for over an hour, we went into the Adventure Park, which offers a multi-level Family Adventure Trail with nine rope bridges and five towers; a 70-foot high, 1000-foot long Zip Line; a three-level Ropes Challenge Course with 45 different activities; a six-story Free Fall; 30-foot Climbing Wall; and 30-foot Cargo Net Climb. The Adventure Park activities are all included in the price of admission for the Water Park (regular $26.99 per person.) Since my boys have season passes, there was no extra charge for any of the water park or adventure park attractions. After tackling all 15 different ropes activities on each of the three levels, ranging from two-feet to 60-feet off the ground for a total of 45 distinct challenges, the boys climbed a 60-foot tower and each jumped off the six-story Free Fall, which lets you experience the sensation of free falling several stories before the auto-belay system engages and gently lowers you to the ground. Even after all those adrenaline-pumping attractions, the boys wanted to return to play on Waikiki Wipeout Zone for another half hour before cooling off in the Lazy River. Then, after about an hour of playing in the water park, they begged me to return to the Waikiki Wipeout Zone for another few rounds. On the ride home, I asked the boys which were their favorite activities. While they rated the Ropes Challenge Course number one, they all agreed the Waikiki Wipeout Zone was worth the trip even if they hadn’t done all the other fun activities. Hawaiian Falls White Settlement is located near the intersection of Clifford Street and N. Las Vegas Trail, next to Veteran’s Park, two miles north of Interstate 30 off of Loop 820. Hawaiian Falls operates water parks in Garland, The Colony, Mansfield, Roanoke and Waco. 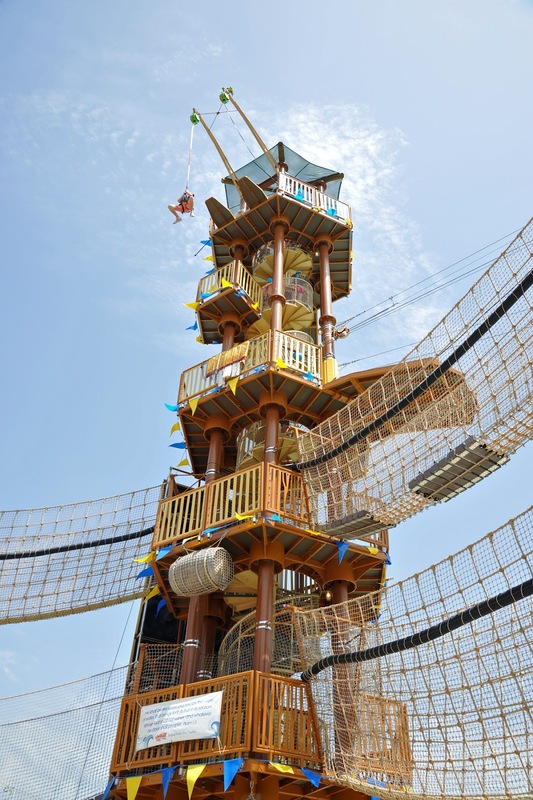 In addition, Hawaiian Falls has combination water park – adventure park – event centers in Pflugerville and White Settlement. More info at hfalls.com.